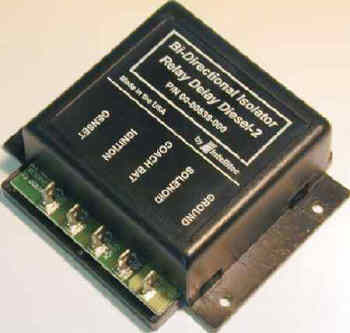 Intellitec's Bi-Directional Isolator Relay Delay- Diesel 2 TM offers a new approach to charging batteries in an vehicle which uses a diesel engine with up to a 200 Amp alternator. Adding a small dash-mounted switch will allow emergency starts of diesel engines, requiring up to 1200 Amps of starter current. Unlike prior systems that only allowed charging the auxiliary battery from the engine's alternator, the Intellitec's Bi-Directional Isolator Relay Delay- Diesel 2 TM charges both batteries when either one is being charged. When the vehicle is being driven, both batteries will be charged from the engine's alternator. When the vehicle is plugged into shore power, both batteries will be charged from the converter or battery charger. If neither battery is being charged, the batteries are fully isolated. The controller also senses heavy loads on either battery to prevent the wrong battery from being inadvertently discharged. The unit is housed in a plastic enclosure for mounting in an engine compartment, out of direct water spray. To connect the two batteries together under proper conditions, it operates in combination with an intermittent duty solenoid, similar to ones used as diesel starter solenoids. In order to use this type solenoid for continuous duty, the controller will engage it with full voltage and then reduce the coil voltage to approximately 4 volts to hold it in. After the solenoid has been closed, the system continues to sense the voltage. If the ignition switch is off and the battery voltage drops below 12.5 volts for approximately 1 minute, the solenoid is opened toprevent the chassis battery from being discharged by the auxiliary loads. This might occur when the converter is heavily loaded. If the ignition switch is on, the control allows the voltage to drop below 12.0 volts for approximately 1 minute, before the solenoid is opened to insure the alternator's full output is available for important chassis functions.